K-4 is an intermediate-range nuclear-capable submarine-launched ballistic missile developed indigenously by DRDO of India to arm the Arihant class submarine(India's first indigenously developed nuclear submarine)and will complement K-15 Sagarika. The missile has an effective range of 3500 km.Recently India test fired K4 successfully. 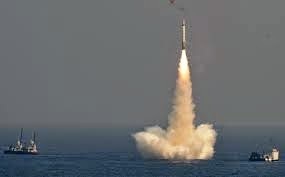 The K-4 SLBM gives India the ability to strike a land target from an undersea firing platform and will be a significant boon to India’s nuclear weapons program, extending India’s ability to credibly deter a nuclear-armed rival from attacking first. A robust sea-based deterrent is necessary to field a credible second-strike capability and the K-4 SLBM will do the same. The K-4 is made with purpose for second-strike.The missile has the advantage of a hypersonic cruise speed and uses an innovative system of weaving in three dimensions as it flies towards its target, making it an exceptionally difficult target for anti-ballistic missile systems and other air defense systems. Other features of the K-4 include its high accuracy, with an alleged near-zero circular error probable (CEP). The abilities of the K-4 are set to allow India to deter China with greater credibility.